Orville Wright flies his glider at Kitty Hawk, North Carolina, in 1911. 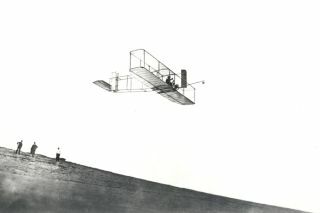 In this historical photo from the U.S. space agency, a photograph of Orville Wright in his glider at Kitty Hawk, North Carolina, in 1911. On October 24, 1911 Orville tested a new glider and broke all the previous gliding records by actually soaring and staying in flight for 9 minutes and 45 seconds. His record lasted for over a decade.